There seems to be lots of blogiversaries about at the minute! Well, just to throw another one into the mix, I wrote my first post on Lipglossiping.com TWO years ago today. It feels like a WHOLE lifetime ago. For once in my life, I’m not gonna take the opportunity to waffle on about what blogging means to me. Suffice to say, I’m a little bit addicted to it. I can quite safely say, that I know each and every single one of us is extremely glad – and grateful – to you for continuing for 2 whole years. Happy Blog Birthday lovely lady!! HAPPY BLOGIVERSARY! I so enjoy your blog. Keep up the great work!!! I’m more of a lurker than a commenter but happy blog birthday! Lipglossiping was one of the first beauty blogs I ever came across and always always find it informative. The “I hope we’re all a bit prettier than we were 730 days ago” actually made me laugh for some reason! I hope so too! Prettier on the outside as well as on the inside. Happy birthday! Happy blog birthday! Here’s to many more! Happy birthday! I’m an enormous fan of your blog. Keep up the incredible work! happy birthday lipglossiping! =)keep those posts coming. Happy blog birthday!! I can’t believe Lipglossiping is only 2 years old?? 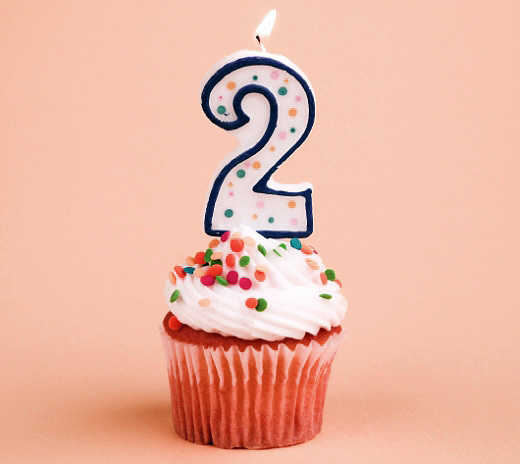 Happy blog birthday and seriously, I can’t believe its just been 2 years! 😀 Keep up the great work! Congratulations! Here’s to many more posts!